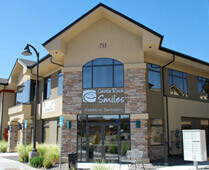 At Castle Rock Smiles Pediatric Dentistry, we put great focus on the prevention of dental problems. Following the guidelines of the American Academy of Pediatric Dentistry and the American Academy of Pediatrics, our office recommends that a child's first visit to the dentist should occur within 6 months of the first tooth erupting, or no later than age one. Currently our practice offers a free initial exam to children under the age of 18-months. During their first visit you and your child will be introduced to the dental team. 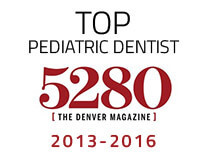 We will discuss your child's oral development, oral hygiene, healthy eating habits, and perform an oral exam. Topics discussed during this exam may include: teething, brushing needs and habits, proper use of bottles and sippy cups, transitioning to a regular cup, pacifier use, thumb sucking habits, dental emergency basics, and most importantly, how to reduce your child's risk of developing dental disease. Cleaning—A dental prophylaxis includes removing plaque and calculus (tartar) from the teeth. Plaque is formed from food, saliva, and bacteria and it sticks to teeth causing tooth decay and gum disease. Having clean teeth and a clean mouth will allow the dentist to examine all the tiny grooves, pits, and fissures of teeth to check for cavities, and permit the uptake of fluoride on the teeth. Fluoride—After your child's teeth are cleaned we provide a professional fluoride treatment which helps to maintain and strengthen the enamel on the teeth. We typically use a fluoride varnish which slowly absorbs into the teeth over the course of a few hours. Because the varnish bonds to the teeth a child can eat immediately after their dental appointment. Fluoride gel is also available if you prefer. Even though kids don’t practice poor lifestyle habits like smoking or using tobacco products, they still have a small chance of being affected by oral cancer. That’s why we provide in-depth oral cancer screenings as part of our routine checkups to ensure the safety and health of your children. This quick and easy visual exam detects oral cancer while it is still small, which allows for an increased chance of a full recovery. Keep reading to learn more about oral cancer screenings and why they’re important for your kids. 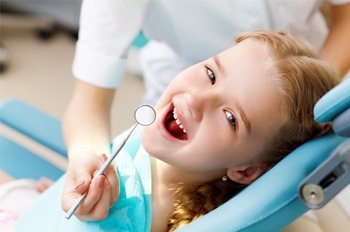 Dental Exam—Usually performed once every six months, this includes an examination of the face, head and neck of your child as well as a thorough examination of the teeth, bite, gums, and overall dental development. During this exam we evaluate your child's dental developmental and check for cavities or dental decay. Digital X-rays—X-rays allow dental problems to be diagnosed and treated earlier which often means that the treatment is more comfortable and affordable. The exact timetables of a child's x-rays are dependent on their individual needs. General guidelines for prescribing dental x-rays are taken as follows: bitewing x-rays once every 12 months, periapical x-rays once every 12 months, and panoramic x-rays once every 3-5 years. By using the currently available digital x-rays and imaging, we are able to provide a comprehensive dental plan while greatly reducing radiation exposure and maintaining an environmentally safe and chemical free atmosphere. Dental Sealants—Once a child has their permanent molars, sealants are an important part of preventative care. A sealant is a thin piece of plastic that fills in the pits and fissures on the chewing surface of the tooth protecting these areas from plaque build-up that could cause cavities. No numbing is required to place a sealant, and the process does not take very long. However, because the sealant only covers the chewing surface of the tooth, the sides and in-between the teeth are still at risk for decay. It is very important to continue a regular prevention program even with sealants in place. Space Maintainer—If a child loses a baby tooth early due to decay or injury, there is a risk that the adjacent teeth will drift into the vacant space leading to crowding of the permanent teeth or even preventing the permanent tooth from erupting properly. Space maintainers are small fixed appliances which prevent the remaining teeth from drifting into the vacant space. Sports Mouth Guards—Once a child has all of their permanent teeth we can fit them for a sports mouth guard. This simple appliance is worn while playing sports to lessen the impact of hits to the mouth, lips, and gums. Before your child loses all his baby teeth there are a variety of options for protecting his teeth while playing contact sports. Please let us know if you would like more information about mouth guards. Bruxism (teeth clenching/grinding) is a common habit among patients of all ages. Children may experience it for a variety of reasons, including stress, sinus drainage or teething. While most cases aren’t too serious, our team may recommend a custom nightguard if significant damage to the teeth is occurring. This device is designed to provide vulnerable smiles with a tough barrier that minimizes the effects of grinding. Because nightguards can interfere with proper jaw growth, Dr. Benzley typically doesn’t recommend them until a patient has already received all of their permanent teeth.